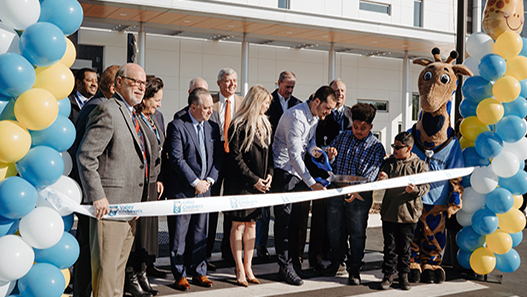 (Modesto, California) – A celebration in Modesto took place today as Valley Children’s officially opened Pelandale Specialty Care Center. Friday’s event included a ribbon cutting ceremony, program and tours of the outpatient center. More than 300 people attended, including Modesto Mayor Ted Brandvold, Stanislaus County Supervisor Terry Withrow, Stanislaus Community Foundation CEO Marian Kaanon, grateful families, community leaders, Valley Children’s representatives and Oakland Raiders Quarterback Derek Carr. Pelandale Specialty Care Center currently offers outpatient services in the following pediatric specialties: Cardiology, Endocrinology, Gastroenterology, Hematology, Nephrology, Neurology, Orthopaedics, Otolaryngology (ENT), Pediatric Surgery, Plastic Surgery, Pulmonology and Urology. In addition to Modesto, Valley Children’s currently has specialty care centers in Bakersfield, Fresno, Merced and Visalia, with one under construction in Fowler (May 2019). Plans are also underway to build new specialty care centers in Visalia and Merced to replace the existing outpatient centers there and an additional center in north Fresno. Valley Children’s Healthcare also wishes to express its gratitude to the many generous donors who helped fund construction of Pelandale Specialty Care Center, many of whom attended today’s event. For more information on Valley Children’s services in Stanislaus County, please visit www.valleychildrens.org/pelandale.